Dott. 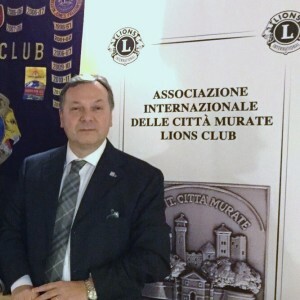 Prof. Giuseppe War of the Lions Club Lucca Le Mura. On the occasion of the XII Congress of the Association, was elected international president, for the biennium 2015/2017, Prof. Dott. Giuseppe Guerra (pictured), a charter member of the Lions Club Le Mura Lucca, of which he was President in 2000 / 2001. The Neo Chairman has held numerous positions lionistici, both in The District 108, to name a few, those of Zone Chairperson and Chairperson, both in Multiple District 108 ITALY as President and Member of the Commission for 2006/2009 service activities, both International level with the position of Coordinator for the District 108 the LCIF (Lions Clubs International Foundation) for the 2009/2012 triennium. He has received numerous awards and honors, among them the Helping Hand Award (Helping Hands) by LCIF and 5 (five) MJF (Melvin Jones Fellow). The new President plays the Professor of Economics and Appraisal activities and freedom of Dr. profession. Agronomist. And ‘Vice President of the Association Dr. Agronomy and Dott. Forestry in the provinces of Pisa Lucca and Massa Carrara. Technical Consultant of the Court of Lucca. Expert Legal Appraisal. Married to Josephine, a biologist, has a son, Francesco, also Biologist, married to Arianna, Professor of Spanish and Master Piano. A little over one year’s grandfather Julius.